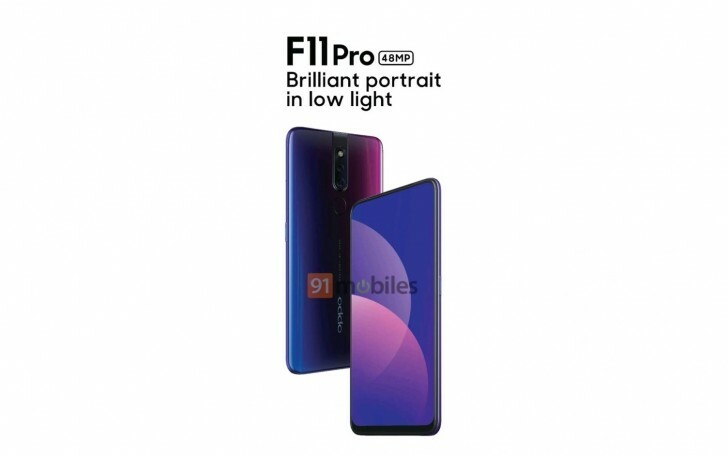 An official-looking render of the OPPO F11 Pro have surfaced. It shows a full-screen display, which suggests that we will see a pop-up front-facing camera, possibly similar to the Vivo NEX S.
The poster also says “48MP” and “Brilliant portrait in low light,” meaning the OPPO F11 Pro will sport either the Samsung ISOCELL GM1 or Sony IMX586 sensor. You might think one tagline is linked with the other, but the source says the new camera will be on the back while the selfie shooter will just be 32MP. The render also reveals the dual camera system at the back, coupled with a single LED flash, and a regular oval fingerprint scanner. The color of the OPPO F11 is also revealed in the render with a neat gradient color that is blue on one side and red on the other.